Departs at 8.30 daily (except Sundays). Attractions are less crowded outside of the summer season. We are comparing Vatican and Colosseum Skip the Line Tickets Prices from leading ticket suppliers and Try to find you Cheap tickets prices on the market. This is a full day sightseeing tour which takes you to the highlights of the Eternal City. In just 8 hours you will visit the Colosseum, where beasts and Gladiators fought fierce battles over 2,000 years ago, as well as the famous Vatican City, the official home of the Catholic Pope. Meeting in the morning you'll avoid the crowds and skip the lines to the Vatican Museums, Sistine Chapel and St. Peter's Basilica. Your friendly guide will lead you through some of the 54 galleries containing Egyptian artefacts, stone sarcophagi, statues, sculptures, Renaissance painting and renowned frescoes by the great Michelangelo. You'll learn about history, religion, art and politics, and still have time to snap some selfies. In the afternoon you'll visit the largest colosseum built during the reign of the Roman Empire, as well as the remains of the Roman Forum and Palatine Hill. This is a great chance for first-time visitors to see the best of Rome in one compact day tour. A good option for people who want to see the top Rome attractions in just one day. Suitable for people of all ages and open to both adults and children. Your Experience With Vatican and Colosseum Skip the Line Tickets? Visit the homes of two powerful historical forces in the same day: the Vatican City, home of the Catholic Church, and Rome's Colosseum, the largest building of the Roman Empire. 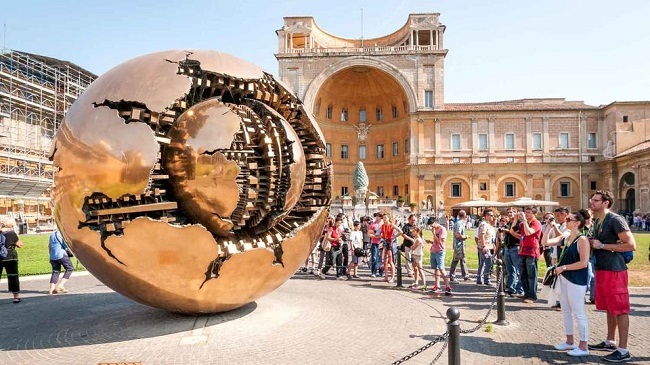 Enjoy skip the line entry to the 4 of Rome's top attractions: The Vatican Museums, Sistine Chapel, St. Peter's Basilica and Rome Colosseum. Benefit from the extensive knowledge of an art historian guide. What Vatican and Colosseum Skip the Line Tickets Includes? Fast track entrance to Vatican site, including Museums, Sistine Chapel and St. Peter's Basilica. Fast track entrance to Rome Colosseum. Vatican Museums – St. Peter's Basilica – Sistine Chapel – Rome Colosseum. Travelers Reviews about Vatican and Colosseum Skip the Line Tickets? This tour has a 5 out of 5-stars on TripAdvisor, which is partnered with Viator. Comments agree that the tour of well organised and informative. Travellers say that the skip the line entry is a ‘must' if you want to visit all these attractions in one day. Bring tickets in paper or electronic format. Tickets are refundable but cancellation fees may apply. This tour is available daily in English, tours in German, Spanish, French and Portuguese are available on specific days and for small groups tours may be conducted in up to 3 languages. Please wear comfortable shoes and conservative clothing, knees and shoulders must be covered to enter religious sites. Lunch and transport between Vatican City and Colosseum is not included (unless specified in booking). On Wednesday morning's tours will visit the Vatican Library instead of St. Peter's Basilica. Meeting point will be specified in booking conformation; hotel pick-up may be possible.